The festival of Raksha Bandhan (Rakhee) falls this year on August 13. Big and small stores display Rakhee (hand bands) in all shapes and colors. These bands are lovingly bought by sisters to be tied around their brothers’ wrists on Rakhee day. This symbolizes the commitment by the brother to take care of his sister for the rest his life. The sister in turn prays for the welfare of her brother. Today even brothers tie this thread around their sisters’ wrists as a symbol of deep affection. Although most known to demonstrate the love between brothers and sisters, historically this thread which literally means a bond of protection (Raksha – protection; Bandhan –bond) can also be tied by a mother or daughter. Sages or Gurus tie this thread around their followers’ wrists for the same reason – blessing and protection from all that is evil. 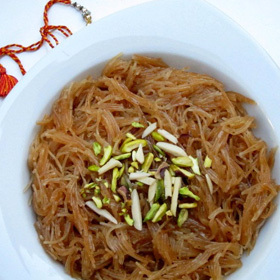 A traditional Rakhee food is Sevain (loose translation – vermicelli pudding). 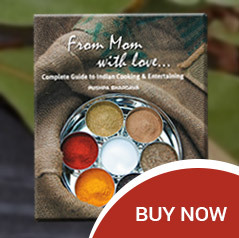 Treat your loved one to this very delicious desert this Rakhee. Warm a nonstick frying pan on medium high heat. Add ghee or butter. After the above has melted, add the vermicelli. Stir for two minutes and add warm water. Stir again, turn heat to medium low, cover and cook for ten minutes or till the vermicelli is soft and the water has dissipated. Add sugar, stir and turn heat to medium. Cook for about three minutes and add cardamom. Cover, turn heat off and leave on stove for ten minutes. Garnish with pistachio and almonds. Serve warm.